Constant Troyon (1810–1865), On the Way to Market (1859), oil on canvas, 260.5 x 211 cm, Hermitage Museum, Saint Petersburg. Wikimedia Commons. Having written about Edward Charles Volkert and George Morland and their paintings of farm animals, I cannot but cover the great Constant Troyon (1810–1865) in this article. He was born in Sèvres, into a family who were inevitably associated with the major porcelain manufacturer there. He started as an apprentice painter in the factory, but wanted to use his skills for larger-scale paintings. By about 1831, he had left the factory, and was painting landscapes on his travels through France. He became a pupil of Camille Roqueplan, who introduced him to the members of the Barbizon School. 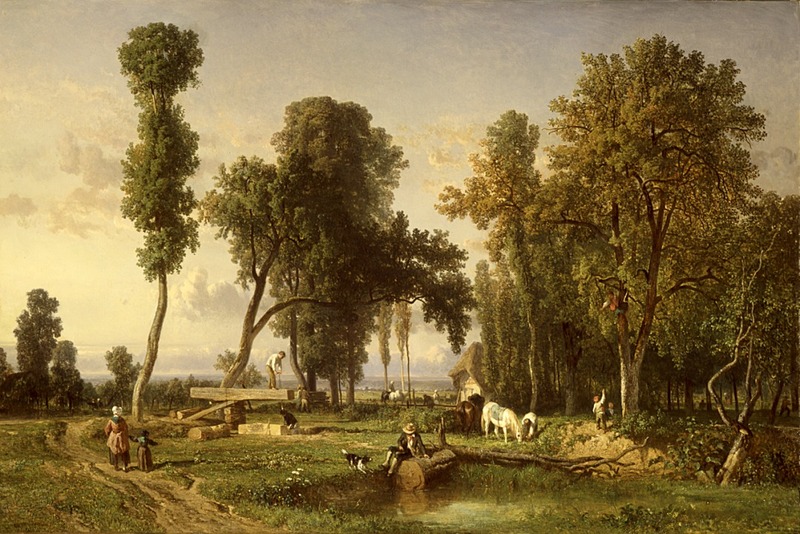 Constant Troyon (1810-1865), View at La Ferté-Saint-Aubin, near Orléans (1837), oil on canvas, 129 x 192 cm, Los Angeles County Museum of Art, Los Angeles, CA. Wikimedia Commons. It is often stated that Troyon’s early works were indifferent, but I beg to disagree. 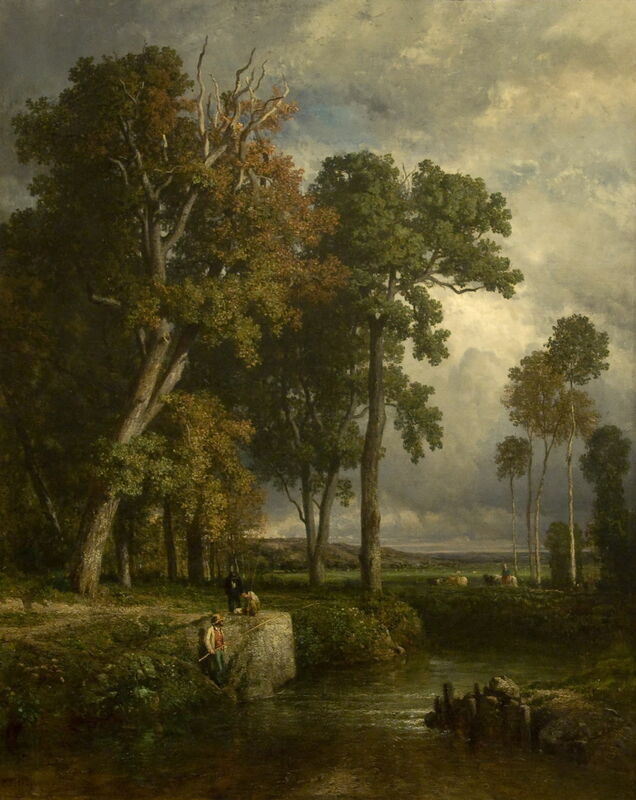 The few works which are now accessible, such as his View at La Ferté-Saint-Aubin, near Orléans (1837), include some wonderful landscapes, which appear influenced by John Constable, who died in the year that Troyon painted this. 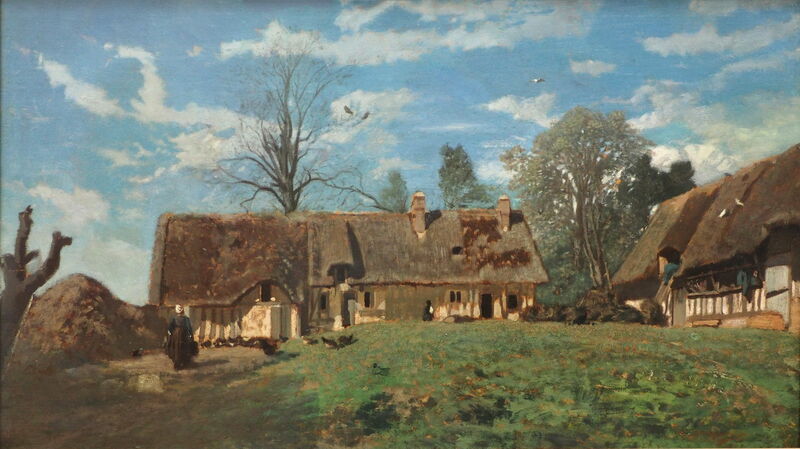 Constant Troyon (1810–1865), Farmhouse in Normandy (before 1845), media and dimensions not known, Niedersächsisches Landesmuseum, Hannover, Germany. Wikimedia Commons. His Farmhouse in Normandy (before 1845) is an unusually wide-angled view from low down, which appears quite original. Constant Troyon (1810–1865), Anglers (date not known), oil on canvas, dimensions not known, Museu Calouste Gulbenkian, Lisbon. Wikimedia Commons. 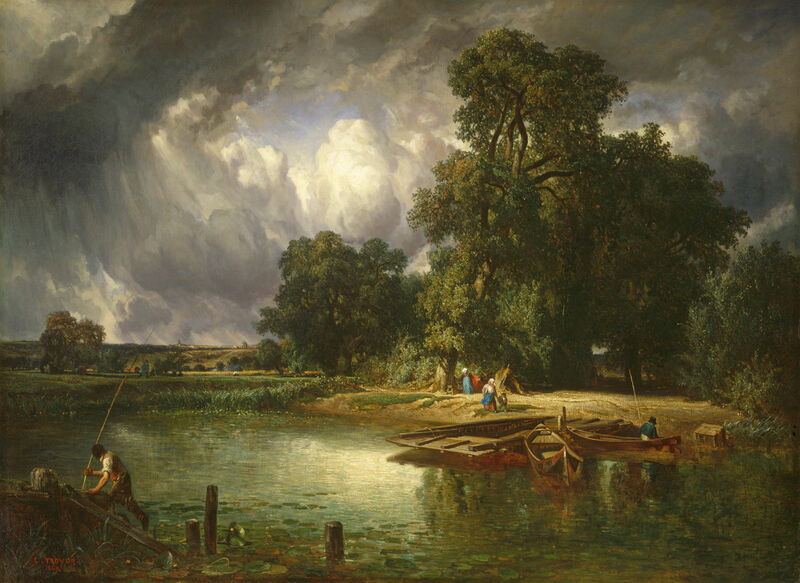 Although not dated, his Anglers could easily have shown a moment in Constable’s rural Suffolk. In 1846, Troyon travelled to the Netherlands, where he saw the cattle paintings of Paulus Potter, and studied the works of the Dutch Masters. As a result, his subject matter and style changed, and he concentrated on painting farm animals in landscapes. These quickly became very successful, and he was awarded a total of five medals for his paintings shown in the Paris Salon, and the Legion of Honour. 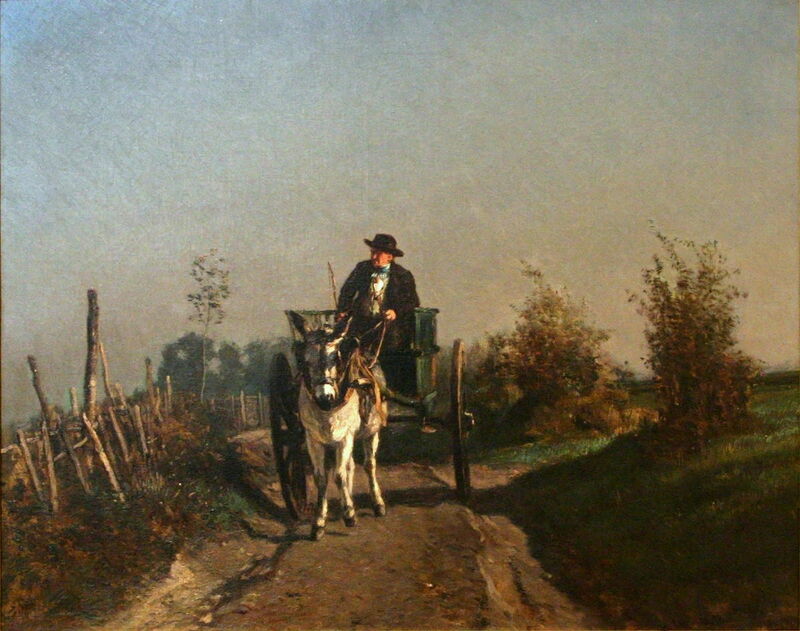 Constant Troyon (1810–1865), A Farmer in his Cart (date not known), oil on canvas, 60 × 73.5 cm, Musée de Tessé, Le Mans, France. Wikimedia Commons. His undated A Farmer in his Cart shows a common form of transport at the time, and his journey from landscape to country animals. 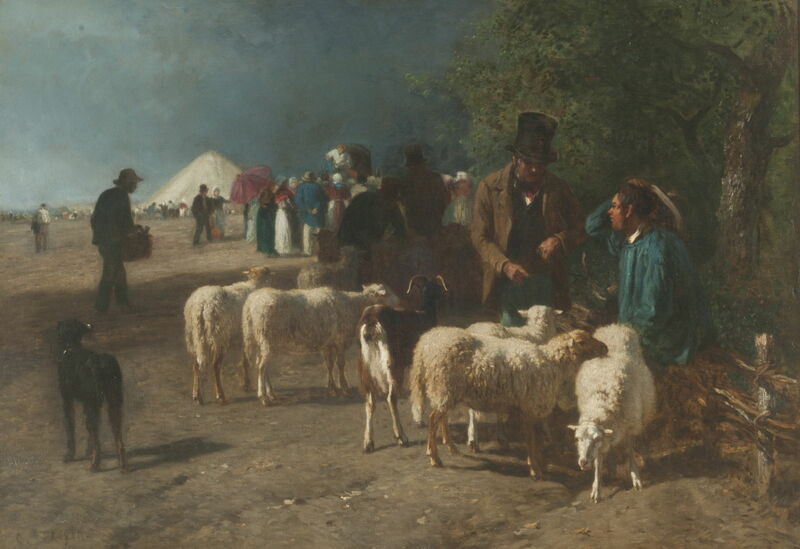 Constant Troyon (1810–1865), A Sheep Market in Normandy (date not known), oil on canvas, 59 x 84 cm, National Museum of Fine Arts in Buenos Aires, Argentina. Courtesy of National Museum of Fine Arts in Buenos Aires, via Wikimedia Commons. He not only painted farm animals in the fields, but followed them to market too, as in his undated A Sheep Market in Normandy. Pissarro also took to painting scenes of country markets, although none was as thoroughly agricultural as this. 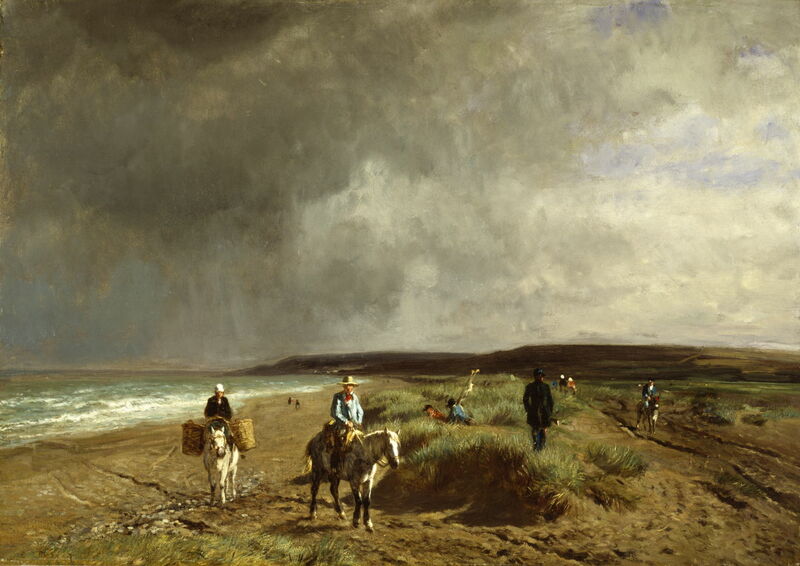 Constant Troyon (1810–1865), The Approaching Storm (1849), oil on canvas on board, 116.2 x 157.5 cm, The National Gallery of Art, Washington, DC. Wikimedia Commons. Surely the most outstanding of his early paintings must be his The Approaching Storm (1849). Set on a Constablesque river, two anglers appear to be readying themselves for the torrential rain which is heading in their direction, while others still wander in the last patch of sunshine on the far bank. 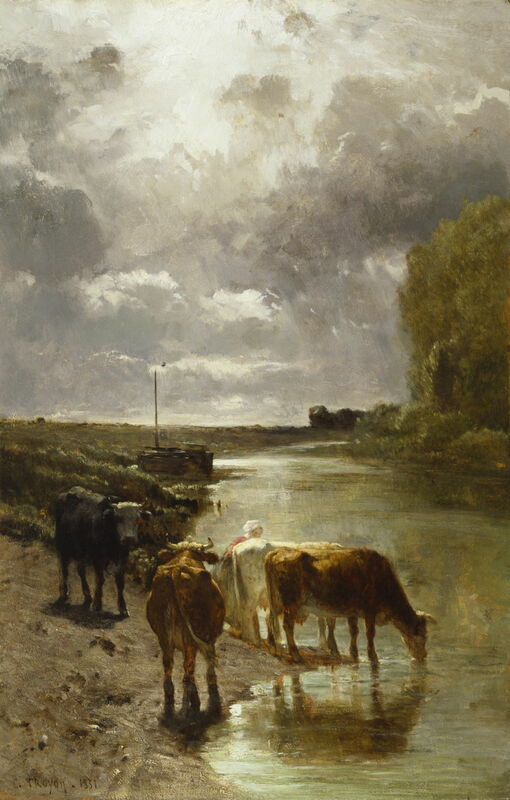 Constant Troyon (1810–1865), Cattle Drinking (1851), oil on oak panel, 78.4 x 51.8 cm, Walters Art Museum, Baltimore, MD. Wikimedia Commons. Troyon appears to have been particularly successful when painting into the light, or contre jour, as in his wonderful Cattle Drinking (1851). This shows the banks of the Touques River in Normandy, which he frequented in the 1850s, sometimes with Eugène Boudin, who was a great influence on Claude Monet and Impressionism. After Troyon’s death, this painting was still held in high regard: it was even included in an exhibition of the ‘hundred best masterpieces’ at the Georges Petit galleries in Paris, in 1883. Constant Troyon (1810–1865), Repose (date not known), oil on canvas, 72 x 88.5 cm, Walters Art Museum, Baltimore, MD. Wikimedia Commons. 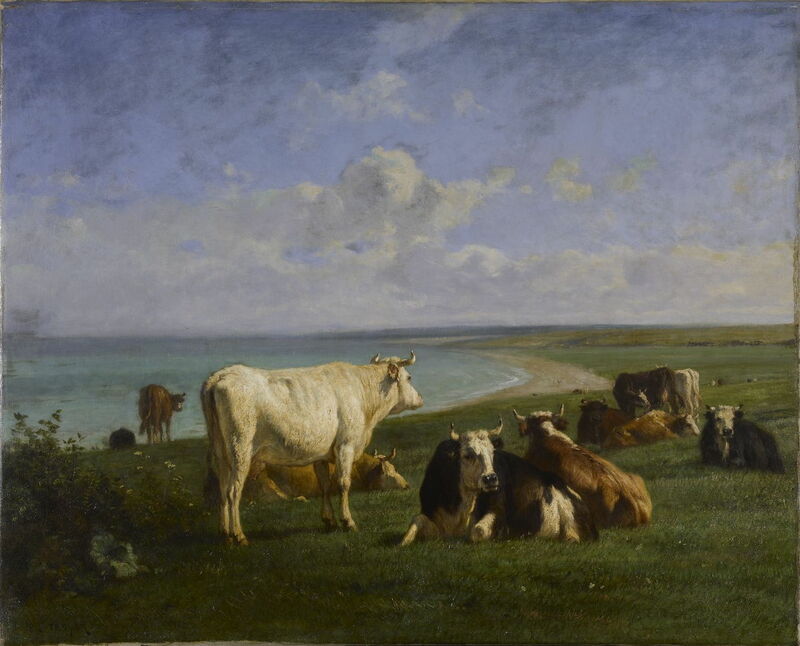 Troyon also loved to paint coastal scenes, and the combination of the Normandy coast and cattle, on a sunny day, brought his Repose (date not known). Constant Troyon (1810–1865), Cows in the Field (c 1852), oil on canvas, 93 x 75 cm, Hermitage Museum, Saint Petersburg. Wikimedia Commons. 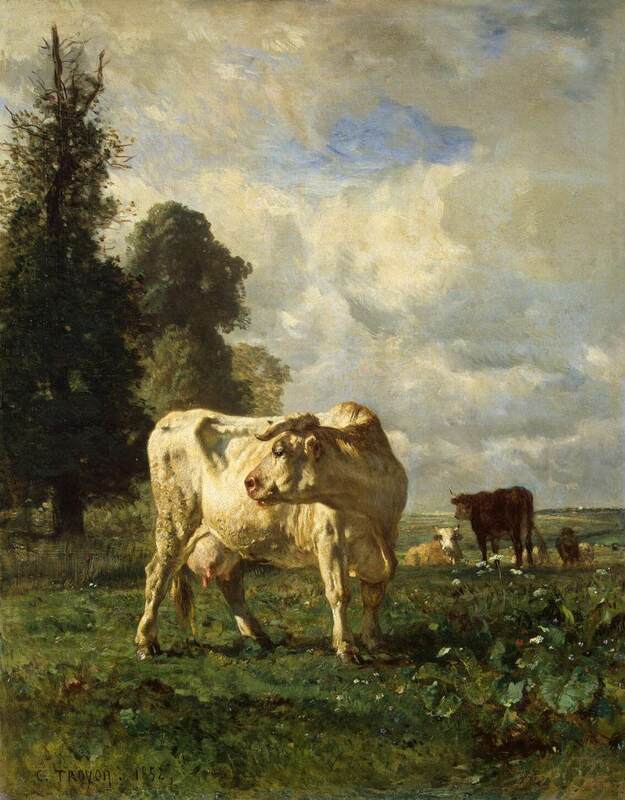 Given just a few trees and cattle in a field, Troyon painted popular works such as Cows in the Field (c 1852). 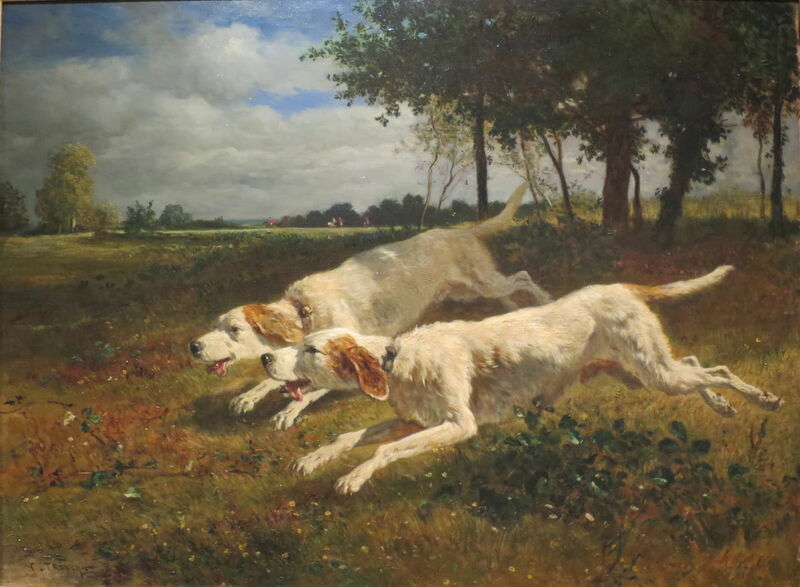 Constant Troyon (1810–1865), Running Dogs (1853), oil on canvas, 75 × 111 cm, Pushkin Museum, Moscow. Wikimedia Commons. His later paintings include a wide range of domestic animals, including these Running Dogs (1853) and geese, as well as horses, cattle, and sheep. 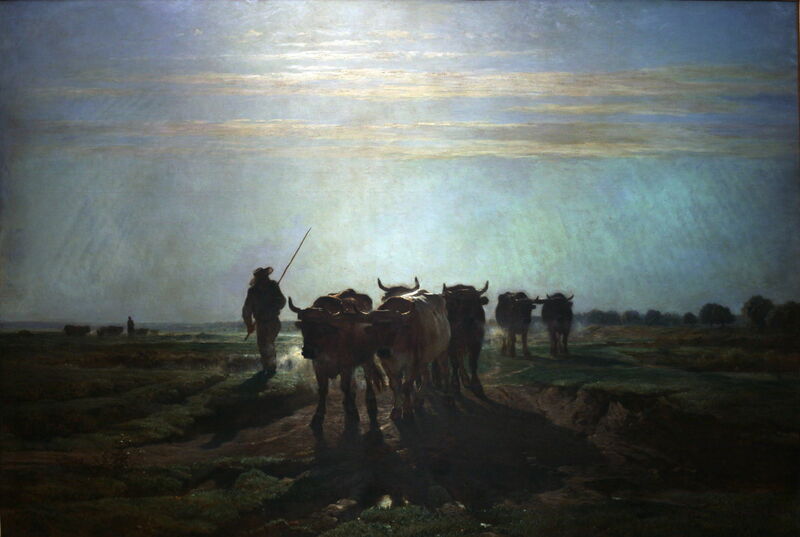 Constant Troyon (1810–1865), Oxen Going to Work (1855), oil on canvas, dimensions not known, Musée d’Orsay, Paris. Wikimedia Commons. 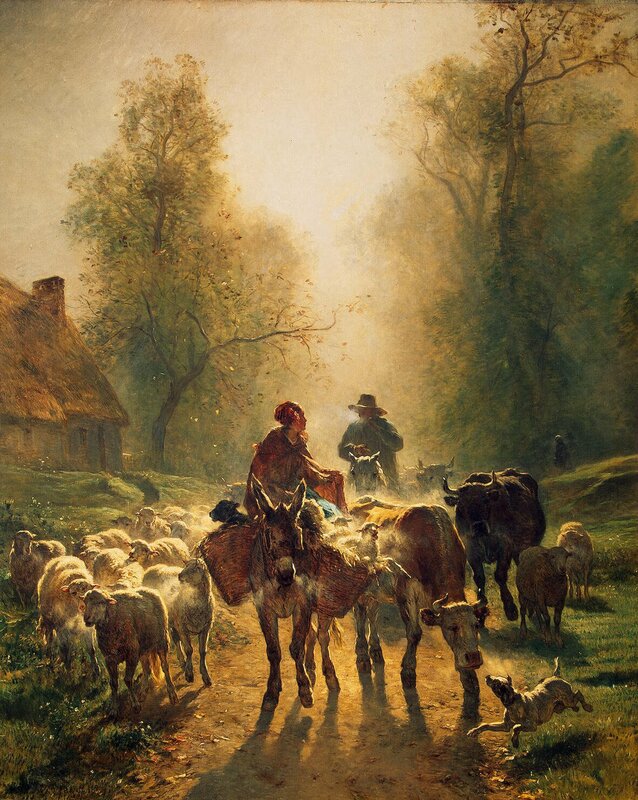 Painting into the light again, he captures the steamy breath of Oxen Going to Work (1855). With his commercial success, Troyon bought a house at Villers, where he later painted his Coast near Villers (c 1859). With a rainstorm on its way, a couple who have been collecting seaweed into the panniers on one of their ponies set off to return, while hunters erect their fowling nets to catch birds. Of all his paintings, though, it is his On the Way to Market (1859) which epitomises Troyon best for me. Its melee of sheep, cattle, dog, donkey and horse are outlined by the brilliant sunlight, which combines with the breath of the animals and the dust kicked up by their hooves to create a remarkable shallow-focus effect. This must surely have been inspiration for some of Pissarro’s much later, and equally brilliant, paintings. Posted in General, Painting and tagged Barbizon, Boudin, cattle, Constable, landscape, Monet, painting, Pissarro, sheep, Troyon. Bookmark the permalink.